Ford India is testing Ford EcoSport top of the line TDCI Diesel in Indian. A test vehicle has been recently spied without any camouflage on Chennai roads in India. 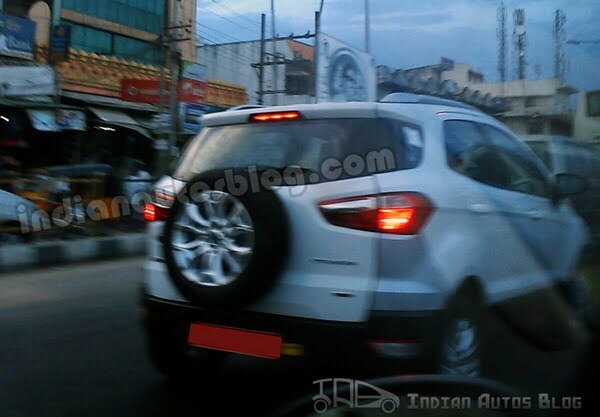 This EcoSport seems to be a part of road testing car for the upcoming EcoSport official launch planned for early 2013 in India. Interestingly the test vehicle has Titanium TDCI badging which means that it a top end diesel variant with the 1.5 Litre diesel engine which does the duty in 2011 Fiesta Diesel, but there are many elements which support the fact that this is not the final production model. Ford India has got more than 6 months for the official launch of the EcoSport at the time when the test vehicle is spied and it will try out the vehicle amply before they finally bring it on tough and unforgiving Indian roads. The car does have the premium looking webbed alloy wheels but there is no chrome garnish and fog lamps in the front bumper which confirms that this is not the final production version. 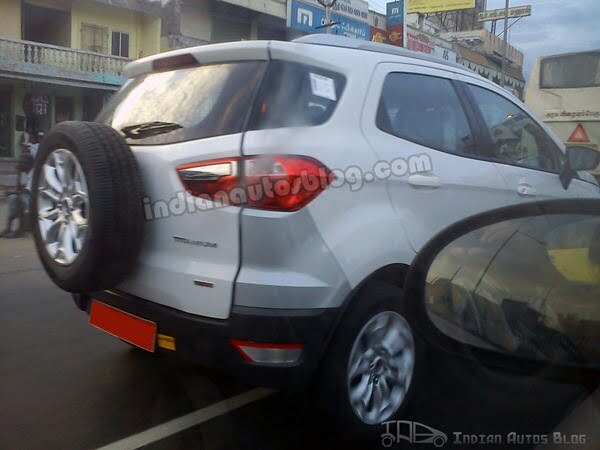 Ford is using different alloy wheel design for India when compared to Brazilian EcoSport which was spied recently. Indian EcoSport has more glossy and more gaudy alloys, most likely based on some customer feedback or some design survey related to Indian preferences. The Brazilian Ford EcoSport has a more simple and less shiny design compared to the Indian alloy wheels. 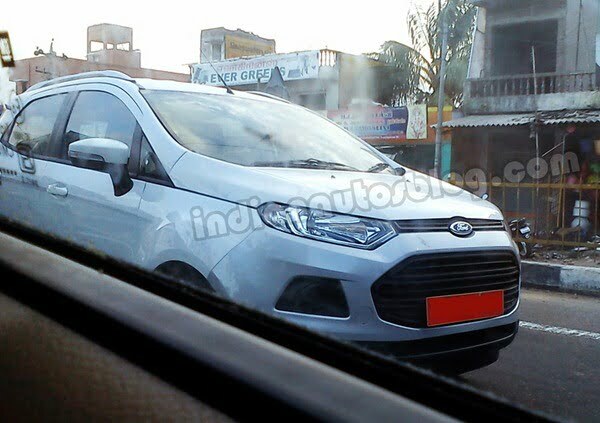 Other visual elements of the Ford EcoSport which are revealed in these spy shots is the high quality of materials used for exteriors of the car. The quality of headlamps and rear tail lamp cluster, visual elements like the roof rail and rear spoiler, rear washer and wiper etc. make the EcoSport a really sporty compact SUV or a compact Crossover. The production version for India is yet evolving in its final stages and we hope that it will come out with a pleasing exteriors and features. The interiors of the EcoSport are officially revealed at China and it seems to be hugely inspired by the global Fiesta with the similar colours and design on the inside. As a complete package, the EcoSport does look very promising car for the young buyers who want the space and comfort of an SUV in the price of a sedan. We will keep you posted on the latest updates on the EcoSport, stay tuned.